Farm & Country Supplies has a wide selection of products for cleaning and sterilisation. With the dairy chemicals at our online shop, you will be able to keep your dairy operation in perfect order, meeting all health standards and requirements. 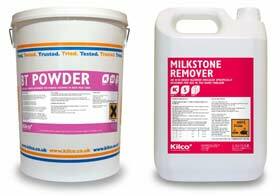 Kilco's selection of dairy chemicals provide all-round protection and sanitisation. For the thorough disinfection of tanks and pipelines, Kilco's range includes incredibly effective solutions. You will find the ideal product to suit your cleaning methods. For effective cleaning of the tanks in your dairy, chemicals that have been specifically designed for cleaning and sanitisation have been produced by Kilco. For the cleaning of Direct Expansion tanks, Kilco's DX Autotank has been produced following the most stringent and in-depth trials. As a result of these intensive trials, DX Autotank has been proven to be one of the best detergent sanitisers on the market today. When using the paste method for cleaning, Kilco has refined their dairy chemicals to produce BT Powder, providing the best in manual cleaning of bulk milk tanks. This white, crystalline powder is chlorinated, making a purified coating of the tank's surfaces. This actively reduces harmful amoeba and bacteria. Kilco's cleaning products for pipelines are among the most efficient and successful available. Topband Total is not only incredibly effective, but budget conscious too. Being a concentrated powder, the solution goes much further, and sterilises all of the internal surfaces of the milk pipeline. Blending a high level of chlorine for sterilisation, scale retardants and water softening agents, Kilco Topband total not only cleans and sterilises, but maintains the milk pipeline. Non-foaming, this cleaning powder can be used in hard water or softwater areas. We have dairy chemicals designed to sustain a very high level of hygiene, for all fields of farming. Take a look at our excellent range of cleaning and sterilising products online at Farm & Country Supplies.